At The Master Switch, we spend an awful lot of time thinking about audio. More importantly, we spend an awful lot of time thinking about how to improve it. Everything we do is geared towards creating bigger, better sound. If you just want to improve your headphones' audio quality in a simple, cost-effective way, it’s easy to get overwhelmed. That’s one of the things we’re going to tackle in this piece. So much listening these days is done over headphones, and so much of it is done over bad headphones, creating audio which is - for lack of a better word - crappy. So in this guide, we’re going to answer a very simple question: how can you quickly improve and enhance your headphones' sound quality? How can you make them better? There are four ways, and the best part is, you can do some or all of them, and it'll still make a difference. ...and we don't mean by curbing your addiction to Justin Bieber. Hey, you want to bump the Biebs all day, that's fine by us. What we're talking about is making the Biebs (or whoever) sound as good as possible. Spend enough time reading about audio, and you’ll come across a particular term: the signal chain. Essentially, this refers to the path that the audio takes from where it’s created, to where it enters your ears. The signal chain is comprised of the software and hardware that converts the audio into sound waves that you can actually hear. If you want decent headphone audio, you have to make sure you have a strong signal chain. That means that every link in the chain – every bit of equipment you use – has to be of reasonable quality. That includes the actual music you’re playing. We’re not talking about the actual quality of the musicians or bands; what you listen to doesn’t matter, but how you listen to it does. If you are playing music from a terrible source, then the greatest signal chain in the world won’t help you. If you want to create a great audio experience in your headphones, it all starts with how you play your music. We would dearly love to tell you that the only way to do this is to play your music off vinyl or CD – those are, quite frankly, superior audio sources to most digital stuff. We’re not trying to be snobbish about this – it’s just the truth. Unfortunately (or fortunately, depending on how pretentious you think we’re being) most listening these days is done from digital files, either streamed or saved locally. Most of it is also done from files that are highly compressed, sacrificing audio quality for space, or streamed down a WiFi network via a music service like Spotify. Guys: you are better than this. We are all better than this. Getting reasonable quality audio isn’t difficult. You can do one of two things: either start importing your music without compressing it to a low-quality format(the import options in any music player should allow you to do this) or start listening to high-quality streaming. The easiest way to do this is by signing up to a streaming service like Spotify or Tidal. The paid versions of these - and they really are priced very reasonably - offer various levels of streaming quality, all of which are very good. Tidal is arguably the best, in terms of sound quality, if not useability. At its highest tier, called Tidal HiFi, it offers a quality of 16-bit/44.1 kHz FLAC audio, which is very good indeed. Spotify, on the other hand, is a little bit cheaper, and while it doesn't offer audio quality that's as good as Tidal, it's still solid, at 320kbps Ogg Vorbis for Premium users. There are other servies too, like Apple Music, although they're nowhere near as good as Tidal or Spotify, in our opinion. We don't really want to get into the key differences here - not when we can easily summarise things like this: Tidal is more expensive but offers the highest streaming audio quality on the planet, while Spotify is almost as good while costing slightly less. Either will be just fine for most people, and the differences are only really noticeable if you're really into audio, and very discerning of sound quality. These are just two options. If you want to create high quality audio at source, there are plenty of ways to do it, like the aforementioned vinyl/turntable option. But if you want a cheap, uncomplicated way to immediately improve your sound quality, this is a very good way of doing it. The next bit in your signal chain is something you probably use every day, but have never noticed: your Digital-to-Analog Converter (DAC). Before the sound goes into your ears, it exists in digital form: the ones and zeros that make up an audio file. Very obviously, there has to be something that converts those ones and zeros into something you can actually hear, and that’s what a DAC is. Every computer, laptop, phone or tablet around right now has its own DAC. It’s what enables them to make any sort of noise in the first place. The problem is, even in expensive phones or laptops, the built-in DAC just isn’t very good. Oh, it’ll work. It’ll do the job of converting audio from digital to analogue. But it’s not going to blow the doors off. It’s not going to be super impressive. If you want to increase your headphone audio quality, the next step is to outsource the DAC. You want to bypass the one in your phone or laptop, and have it take place in a specialised bit of hardware outside it. For the most part, this takes the form of a small, discrete box that attaches, for example, via USB. While it’s possible to get DACs that are seriously large and cost thousands of dollars (like the titantic Schiit Yggdrasil) it’s far more common to see smaller units on the market for as little as $100. Their controls tend to be relatively simple, often consisting of nothing more than an on/off switch and gain knob, with a few different ports that you can plug into. Usually, but not always, you can connect your headphones directly to these, and you can always connect them to an amplifier, which we’ll go into below. The bottom line is this. A DAC is a simple, plug-and-play piece of equipment that instantly increases your audio quality. Connect it, and it just works. And you can get one for as little as $40 – if you’re seriously on a budget, try this tiny Fiio K1 DAC. It’s perfect for smartphones, and is small and light enough to slip into a pocket. You can see a roundup of the current best DACs right here. This is the meat. The good stuff. Upgrading to high resolution audio and adding a DAC will noticeably sharpen your signal chain, but running your audio through an amplifier will give you an immediate, noticeable, even visceral upgrade to your sound. Amps are extremely cool, and if you’re interested, you can see a roundup of this year’s best here. Generally speaking, an amplifier does two things. It boosts the overall volume of your audio, allowing you to get good clarity at lower volumes as well as listen on high-end headphones, and it colors and deepens the sound, improving it in ways that are utterly addictive. Amplifier lore and legend goes deep, and audiophiles can spend decades figuring out the best ones, so we’ll try to keep things simple here. There are a couple of things you need to know when choosing an amplifier. The first is that they come in two flavors: tube and solid state. Technically three, as tube/solid state hybrids do exist, but for simplicity, let’s focus on those two. Tube amps run the audio signal through a glass vacuum tube, burning electrons off a special plate to transmit the sound. In doing so, they give the audio very characteristic quality: fat, warm, even slightly distorted. Also, as we’ve said, immensely addictive. Solid-state, on the other hand, doesn’t quite have the same warmth, but makes up for it with its high level of precision and accuracy. Tube amps can be expensive, although you can find relatively cheap ones (like this Bravo Audio V2, a steal at around $70). They can be temperamental, and definitely aren’t to everyone’s taste, which is why solid-state amps are so popular. We can’t pick for you, but if we had to pick one thing you needed to know when choosing an amp, it’s this. One other thing worth knowing. Every amplifier circuit has two things: a preamplifier, and a power amplifier. Every audio signal, even after it’s gone through a DAC, is extremely low powered, and part of the job of the amplifier circuit is to raise it to a level you can actually hear – to amplify it. A preamplifier handles switching between audio sources, and it boosts the signal’s current gain, enough so that the amplifier can take it and boost its voltage gain. Please don’t make us explain what current gain and voltage gain. It involves a lot of maths and electronics diagrams, and frankly, neither you nor we care that much. All you need to know is that you need the two to work together in order to produce sound of a sufficient volume to listen to. The good news is, you don’t have to go out and buy two separate pieces of equipment. Most amplifiers – certainly the ones you’ll be looking at if you’re just looking to increase your headphone audio quality – are what are known as integrated amplifiers. They contain both preamplifier and power amplifier circuitry. You can, if you want, construct a system with separate pre and power amps, which can be handy if you want to switch out components later on. But for most people, integrated amplifiers are just fine. We’ll talk about more amplifier models we like below, but if you’re looking to get started with a very simple one, try out the Topping NX1. It costs less than $40, and it definitely isn’t going to touch the big boys in terms of quality, but if you’re running your music off a smartphone or a laptop, you’ll hear an immediate difference. You can go very, very deep on headphones if you want. You can spend thousands of dollars on a beautiful, enormous, open-back monster like the Audeze LCD-4. We’d all love to do that. In reality, most people will be quite happy with simply upgrading their pair of headphones, and if you pick right, you can get a very decent pair for a very reasonable price. You can see some of them in our roundup of the best high-end headphones of this year - you’d be surprised how affordable some of them are. As with amplifiers, there are a few key things you need to know to pick the right pair for you. The first is the difference between closed-back and open-back headphones. This refers to the outside of the headphone cups. Closed-back models (like this pair of MEZE 99 Classics - full review here) can sometimes sound a little boxy and closed in, but they don’t have a lot of ‘bleed’ - anyone around you won’t be able to hear what you’re listening to, even at relatively high volumes. They’re also cheaper than open-backs (like these Grados), which have an airiness and depth to them that other models lack, thanks to the interaction of air and the headphone driver. However, they make it very easy for anyone around you to hear what you’re listening to. It also might make sense to choose a pair which is noise cancelling, or wireless. If you do a lot of travel, or you’re on a commute, these might be more worthwhile. These types of headphones will almost always be closed-back – which certainly doesn’t mean that the audio quality is poor – and in the case of noise cancelling, will come with their own built-in amplifier. In this case, you don’t need to worry about separate amps or DACs. It’s also worth knowing the differences in driver types. A driver is, essentially, the part of the speaker inside each headphone cup that makes the sound, and we’ve written a full and frank explanation of how they work here. Tl;DR: dynamic drivers are cheapest and most common, planar magnetic drivers sound better but are bigger and more expensive, and electrostatic drivers cost huge amounts and require specialised amps to run. It’s difficult to do a cheat sheet for choosing headphones, but you can adhere to some basic principles. Got a little bit of money to spend, and do most of your listening at a desk? Get a big pair of open-backs. On a commute? Closed-back, dynamic driver, wireless (or noise cancelling). Every day listening in a home or office, where there are other people around? Closed-back, dynamic driver, regular wired. You get the idea. You might think you have to spend the earth to get a decent pair of headphones – or at least, a pair that will appreciably improve your sound. Not so. We’ll talk about them a little more when we detail our example signal chain in the section below, but for our money, you could do worse than start with something like the Thinksound On2. They are a pair of beautiful, closed-back, dynamic driver headphones that are exceptionally affordable. The sound quality is excellent, and they happily adapt to most setups. You can read our full review here. Or: if you want to experience the world of planar magnetic headphones, which are a special type of drivers that offer broad, airy, widely-spaced sound, you can get a very solid pair of Monoprice M1060s (that's them in the picture above) for around $300. Our full review of those is right here. 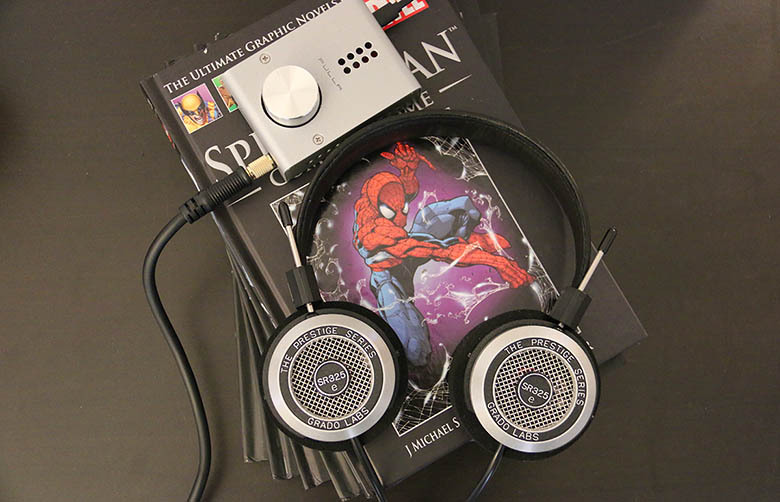 Speaking of which: let’s talk about how to match headphones to amplifiers. This is much less complicated than you think, even though it involves a term called impedance. This is the amount of electrical resistance a piece of equipment has, and it’s expressed in ohms (Ω). Matching a pair of headphones to an amplifier is a simple as finding out the impedance of the headphones, which will be both on the manufacturers website and in the documentation the headphones come with, and checking if an amplifier can handle it. So, taking the above Thinksound On2 as an example: those headphones have an impedance of 50Ω. Most amps (which, similarly, list this sort of thing on the manufacturer website and in their manuals) will give a range of impedances that they handle. Let’s say you’re trying to pay the Thinksound On2 with a Schiit Fulla 2 amplifier (which we go into in more detail below). According to Schiit’s website, that amp handles anything from 16-300Ω – so plugging a pair of Thinksound On2s into it will be perfectly fine. Different impedances give different output power, and there’s a bit more to it than we’ve stated here, but those are the basics, and enough for most people to know. Incidentally, someone put together a fantastic online tool, Audiobot 9000, which helpfully matches up headphones with compatible amps. Oh, and if you're truly confused about headphone specs - terms like sensitivity and impedance and frequency response, which crop up whenever headphones are discussed - we break it all down here. You might think we’re yanking your chain (sorry, couldn’t resist) but it’s very easy to put together a good signal chain for really not a lot of money. We’ll show you. To start with, we’re using Spotify Premium. That’s the first part of our signal chain, and although it’s nowhere near as good as a completely uncompressed audio file, or physical media like vinyl or CD, it will more than happily do the job here. Cost: $10 per month. As we’re running this off our computer, we’ve connected it directly to our external DAC using a basic USB cable. Getting our computer to recognise the DAC is a simple as changing the audio output in the settings menu – in this case, our Mac has immediately recognised our chosen DAC, an Optoma Nuforce uDAC5 (full review here). This is an incredibly simple, usable DAC with great sound, that is relatively cheap (around $179). From here, we connect it directly to our amplifier – the Schiit Fulla 2. The Fulla 2 ($99 - here's our review) actually has its own DAC built-in, but in this case, we’ve elected to bypass it, running a dual RCA-to-TRS cable ($7) into it from the Optoma. This has the effect of bypassing the Schiit’s DAC, and using it as an amplifier alone. This is slightly complicating things, as we could technically just plug the Fulla 2 directly into our laptop via USB and use its own DAC, but it’s a good example of the signal chain. From there, we simply use a 6.3mm adapter to connect our Thinksound On2s to the headphone output of the Schiit. Boom: crisp, rich, deep sound, for less than $500. You can, of course, eliminate $179 from that immediately by simply relying on the Fulla 2’s DAC, and you could invest in less expensive but still excellent headphones like the Grado SR60e’s or the Sennheiser HD280s. As a general rule, the more you spend, the higher quality audio you are likely to get, but even a very basic setup will be light years ahead of a simple connection to your laptop’s or phone’s headphone jack. Let's say you go for the Grados, which are $79 on Amazon at the time of writing. Total equipment cost: $364. That's it. You'll be paying $10 per month for Spotify, but it's worth it. And this is just one example - you can go second-hand, or find alternative cheaper options all over this site. A combo like this will instantly give you better sound, enhancing your audio quality, and make your experience a billion times better. Here is where we annoy every audiophile in existence. Sorry. After extensive testing, and getting the opinions of just about everybody we’ve ever spoken to, we’ve come to the conclusion that for 99% of people, cables don’t matter. Obviously you still need them – you aren't, after all, going to be connecting things without them – but you don’t need to spend hundreds of dollars on cables. You certainly can: there are plenty of high end cables to choose from, like this QED Reference Audio 40. But unless you have ears that can hear a twig break from two miles away, you aren’t going to notice a significant difference. We are aware that this is controversial – please don’t call us idiots in the comments. We just think that it’s far more effective to invest in other elements of the signal chain first, and that most inexpensive cables are of a high enough standard that they will be sufficient for anybody but the most hard-core audiophile. For reference, here are the cables you’ll need to complete a basic signal chain, like the one we’ve detailed above. Most of these will actually come with your equipment, but you may need to buy some individually. This might vary depending on your setup, but this is a good general list. Remember: outside of maybe the RCA cable, there's absolutely no reason to buy your own versions of these, which will come the DAC, amp, or headphones. Yes, the name is pronounced exactly like you think it. The Fulla 2 is a tiny integrated amplifier with a built-in DAC, and it’s immensely simple to plug in and operate, requiring nothing more than a pair of headphones and a laptop to function. The sound is rich and powerful, surprisingly deep for such a tiny little box, and we think we’re going to have a lot of fun with it. In our review, we said, "It doesn’t do anything groundbreaking or noteworthy, but it fulfils its niche perfectly, existing as a simple and effective amp/DAC combo at a very reasonable price point. It’s enough of a departure from the original Fulla to make a difference, and if what you’re looking for is an entry into the world of Schiit, then this could be the perfect buy. Even if you don’t know the world of amps at all, and you just want something to improve your computer sound, then this is - by some margin - the easiest, most flexible and most effective way of doing so. Its versatility, solid sound and superb design make it highly worthwhile, and we think you’re going to love it. We did." Well, we can hardly use it in our signal chain example without talking about more about it, could we? Ever since we did an in-depth review, we’ve had a chance to test this little number in a variety of setups, and it’s never performed anything less than brilliantly. While it’s not going to trouble more expensive DAC, the simple operation and solid, clean sound make it a winner in our eyes. "You could argue that it’s overpriced," we wrote in our review. "That $200 is too much to pay for a device that hangs its hat on a file format that very few will ever hear. But who cares? Even without resorting to DSD playback, the uDAC5 is a simple, effective device, with almost no downsides. Just shell out for the thing already, and thank us later." Not the most advanced set of headphones out there, or the most fully featured, but if you’re looking for a simple pair that will immediately upgrade your sound, these dynamic driver, closed-backs will do the job. The wood finish is fantastic, and the sound is rich and clear without being overpowering. They are designed by legendary audio engineer Aaron Fournier, and his experience shows in how carefully these are tuned. You can read more about them in our review. Here's a sample of what we thought at the time: "It is really, really hard to find fault with the On2s. They have terrific sound, superlative design, excellent comfort and a compelling price point. Admittedly, they definitely aren’t going to satisfy fans of deeper bass, but really, that’s a subjective assessment. For what they are, they provide a genuinely fantastic experience, and if you’re in the market for a new pair of headphones – and want something that will give you maximum bang for your buck – then there should really be only one option: go wood."